Master Po: Close your eyes. What do you hear? Young Kwai Chang Caine: I hear the water, I hear the birds. Po: Do you hear your own heartbeat? Caine: No. Po: Do you hear the grasshopper which is at your feet? Caine: Old man, how is it that you hear these things? Po: Young man, how is it that you do not? That's a relevant quote not just because of the name of the exercise, but because when you do Grasshoppers in high reps it feels like someone is burning a dragon tattoo to the inside of your … [Read more...] about Grasshoppers, young grasshopper. Our favorite fixer of joints, Kristin McLain Milonas, DC, came by for a WOD. Have you ever seen anyone enjoy Burpees so much? … [Read more...] about Yay, Burpee! 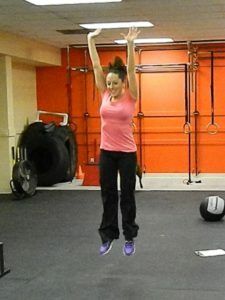 The Kettlebell Swing is a great supplemental exercise for CrossFit programming. It does a really nice job of working the posterior chain, AND is aces for metabolic conditioning. Just make sure you keep your form; especially as you fatigue. … [Read more...] about Swinging! [youtube=http://www.youtube.com/watch?v=jHOZ8HBCgrM] At light weights, Sumo Deadlift High Pulls are a great substitute for rowing. At heavier loads they still pack a metabolic conditioning whallop, and intensely work the posterior chain and shoulder girdle. As befits a CrossFit staple exercise they are a core-to-extremity movement that allow the athlete to quickly and safely move large loads over long distances. … [Read more...] about WTF is a SDHP? Guess who is just a little excited about our new over-sized tire collection?! (Is anyone else reminded of The Shining?) 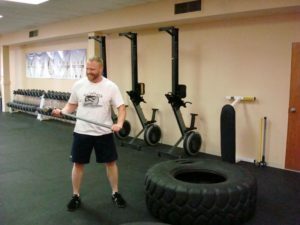 Sledge Hammer swings are great for building core strength, coordination, and accuracy, and improving metabolic conditioning. … [Read more...] about Heeeeeeere’s Marky! Shredders, Up-Downs, Squat-Thrusts, Mother-F---ers...; there are lots of names for them, but in CrossFit we call them Burpees. And no matter what you call them they are simultaneously among the most reviled yet most effective exercises for building metabolic conditioning. They might not look like much but remember you are moving your body's center of mass three feet with each rep. That's no joke. Put them in your routine TODAY! Here's how to do them properly. … [Read more...] about What do you call them?